FD: Going through the Mall of America with you, Kay, is a treat. 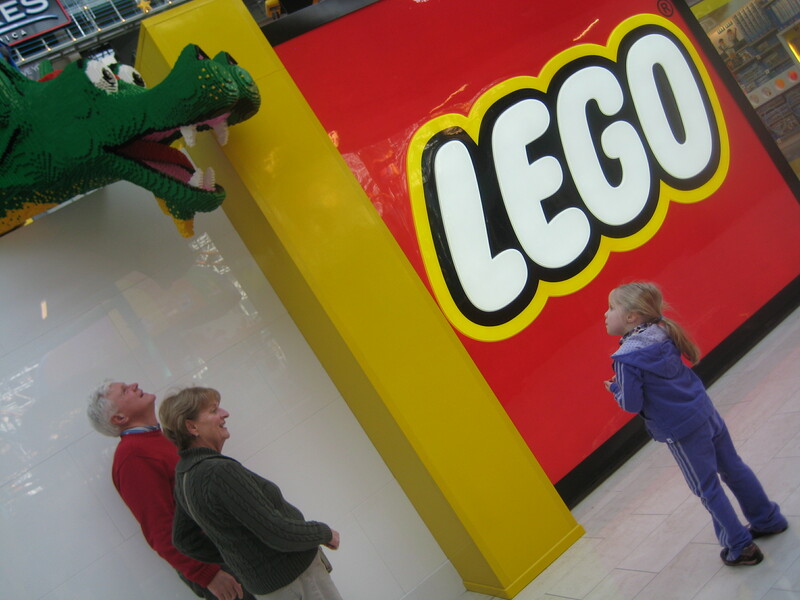 I know you have the pulse on the Twin Cities retail and marketing scene, so it is surprising to me that we see this Lego store at MOA so differently. I was unimpressed by their opening and said as much in my post “How to Waste Windows in Retail.” Thank goodness they have finally done something with those front windows. KR: It was almost as though we saw two different stores! FD: Yeah, I still don’t understand why they put handles on those windows just to let their employees in there to dust the models or whatnot. They are so obvious and I see new visitors trying to open those “doors” all the time – really confusing. KR: I think our shopping buddy above agrees with you! FD: I have to admit the $250 Tower of England model and the other model sets in that window are great aspirational sets that kids and adults want to look at. I guess we can just chalk up their awful windows at Christmas when they opened to yet another failure of a retailer to look its best on opening day due to an inability to get all the parts to the store on time. I see that all the time. KR: My first impression is those wonderful Lego figures soaring high about the main selling floor, visible as you traipse the second and third floors of Mall of America. Now that’s Lego Imagination! FD: There is really only one thing I truly love about this store and that is the Minnesota-themed mosaics they did on the side without windows. It is the only tip of the hat to this particular location and I frankly really truly want to make one of these just as large and impressive at my cabin. KR: I must not have gotten the craft gene; I’m glad they buried the local mosaics on the least trafficked side of the store. It’s not the Mall of Minnesota after all. FD: I know you love the larger than life transformer, dragon and the helicopter dude – and I love that use of space, but maybe because I have been to Legoland the amusement park in San Diego, I am not that wowed by them. They fill in space and make a nice brand statement and I guess because I totally expect something like that, I just am not wowed by their oversized presence. Maybe I’m just jaded. KR: My fav was the look on the face of a young girl I saw looking up at the dragon’s face….sheer wonderment. 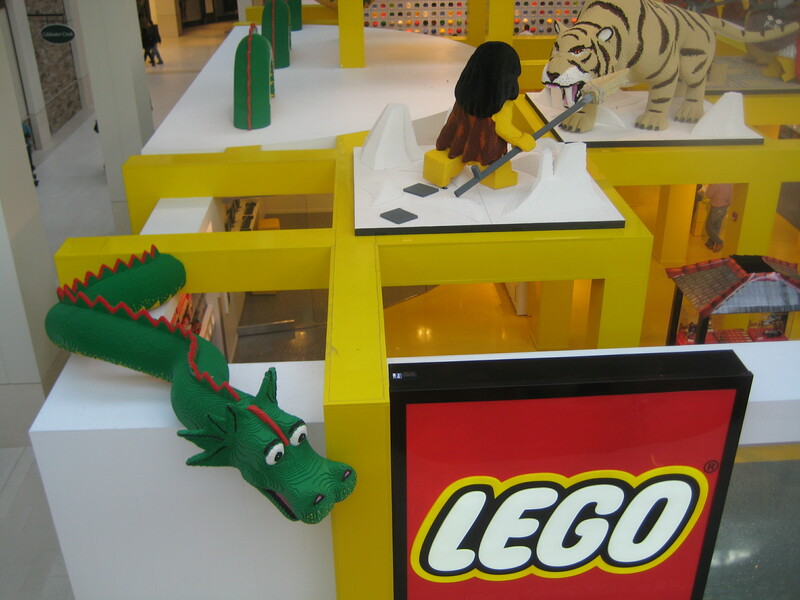 How can you not love 3 stories of Lego magic soaring above the store? Where else in retail does a store get the 2nd and 3rd stories above their store to stoke retail and kiddy imaginations? Times Square maybe…..
FD: The play area sure has changed from before. It used to have a track that kids would build Lego vehicles and then send them down. It wasn’t until you pointed out their use of their iconic Lego shape did I even pick up on what they were doing. KR: Yep, on my second visit, from above I noticed the play area is actually a giant Lego connector; nice branding touch in a popular functional area. 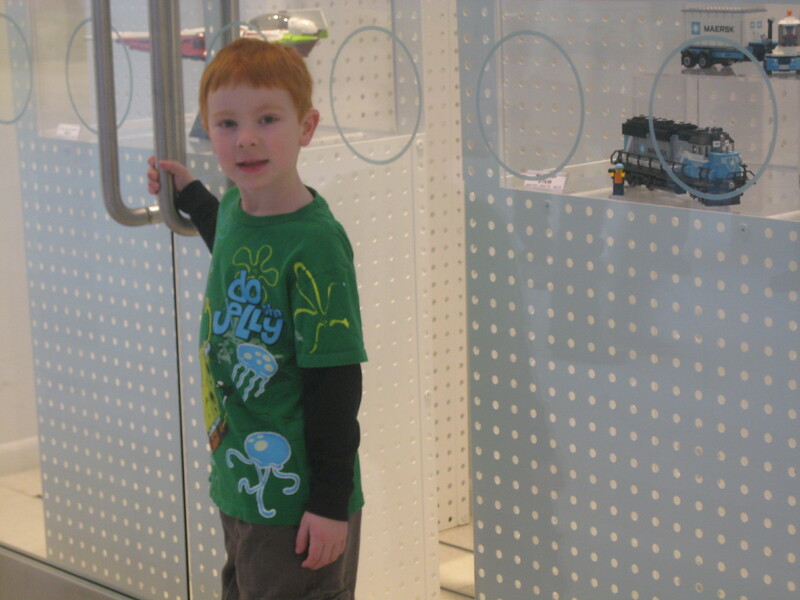 FD: The front of the store is filled with plastic bubbles across the entire wall with specific Lego pieces in them that you can buy in bulk. If you need a green six block or a red four block, you can go there and buy them like produce in the grocery store. It reminds me so much of that same merchandising concept I saw at the Time Square M&M store. KR: Great place to pick up those pieces that have disappeared from the sets at home! Plus the bonus of creating an entire wall of focus framing the checkout counter. FD: I know you think this store is making a ton of money, but I wonder. It’s my experience that flagship stores rarely pay back their rent. I don’t know if Lego is paying for the second and third floor air above their store where the transformer and motorcycle rider abide, but if they do, it’s hard to believe this is a profitable location. I advise retailers who are determined to create a destination flagship store to think of it as a permanent marketing or advertising location and not to expect to have positive income from a flagship. It should be all about building brand identity and invoking a positive experience with the brand the next time they encounter it – even if it is just back home in their usual stomping grounds. KR: Actually, I said if they aren’t making a ton of money, they should go to Retail Jail! I mean, look at this location! Practically on the front door of Nickelodeon Universe at Mall of America….and three feet from the Microsoft – Apple battleground. The traffic can’t get much better! FD: Let’s face it, most people are not going in there to buy the $150 Hogwarts Express kit. They are probably just going home with one of those $7 Bionicles set. KR: Makes me long for those days I had access to percentage rent figures for a major shopping center company: we want sales numbers!!! I guess we’ll have to be satisfied with our trip to a reopened Lego Imagination Center we now imagine in two very different ways! *With a huge tip o’ the hat to Rick Nelson and Claude Peck of Withering Glance!